Engineered and built for commercial fitness, perfect for home use. 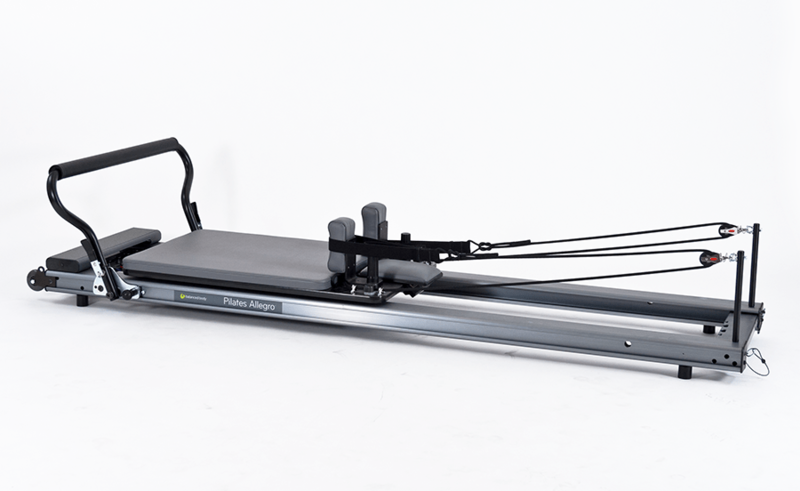 The Allegro® Reformer, with more than 43,000 in use, is the most widely used and recognized Reformer in the world. And it keeps getting better. The Allegro has won rave reviews from Pilates studios and fitness clubs for its ease of use, adjustability, safety and solid construction. Engineered and built for commercial fitness, the Allegro® is also perfect for home use. 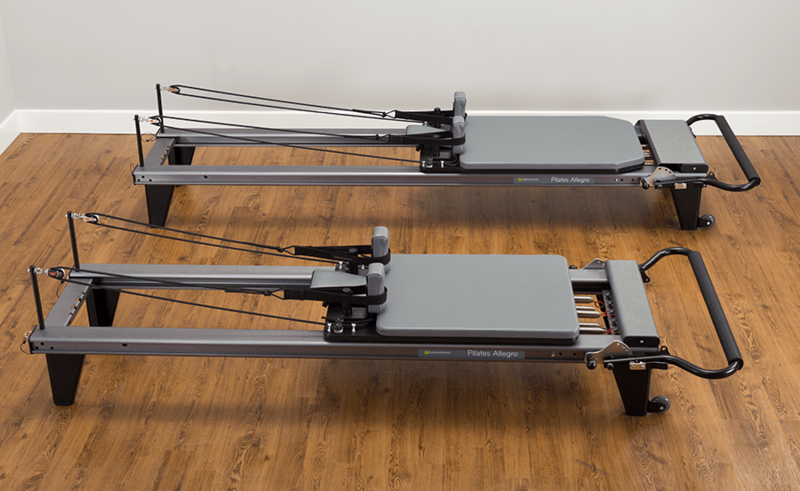 The Stretch version of the Allegro Reformer, recently updated, is perfect for large and tall users over 6'4" (195cm). At 36" (91cm) wide with a securely-locking footbar. It’s 4 horizontal and 4 vertical positions accommodate users of all sizes and abilities. The Allegro Stretch frame is 18" (46cm) longer than the standard Allegro—great for jumping!—and the carriage is 2" (5cm) wider and 6" (15cm) longer. An oversized standing platform is included, and additional footbar adjustments accommodate shorter users, too. The most versatile Reformer on the market, the Allegro offers all the pro features of our Studio Reformer® – plus it is portable. It stacks and stores vertically for convenient storage. Fast to set up right out of the box – really! And at just 113 lbs. (51kg), it’s incredibly easy to move and store. Build your program at your own speed, and expand your exercise options by adding compatible accessories: tower, legs, mat conversion and more. And do it all without needing additional space. No Reformer is more versatile for group exercise, personal training, rehab sessions, or home workouts. Limited 10-year warranty on frame & footbar. Side-by-side comparison of the Allegro Reformer (foreground) and the Allegro Stretch Reformer (background). Launch a profitable Pilates program economically and efficiently with Allegro training and equipment packages. For information, contact us at 1-800-PILATES or info@pilates.com. 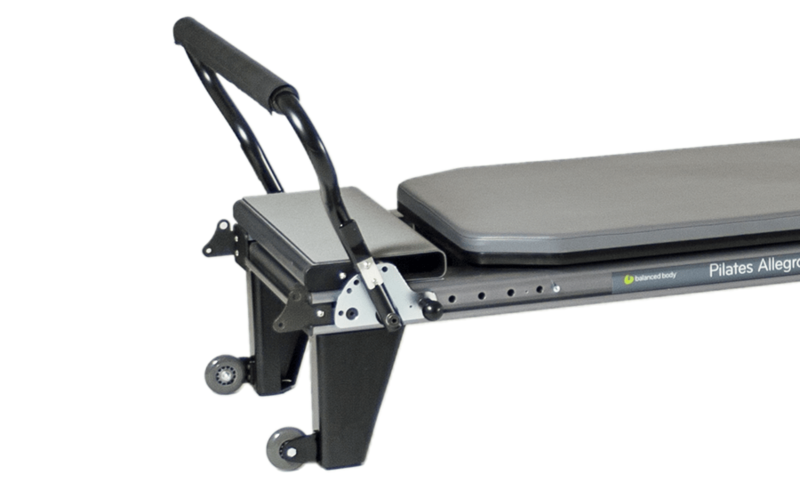 Purchase a Sitting Box with your Allegro Reformer, and we’ll include a free Foot Strap with your order. If for any reason you are not 100% satisfied with your Allegro Reformer, simply return it to us within 30 days for a refund (less freight). Guarantee applies to U.S. domestic customers only. CE approved medical device (Class 1). Stacks or stores on end for convenient storage, with or without legs. Rolls into place with built-in transport wheels. A person of moderate strength can easily move the machine. Choose your height. Without legs the Allegro frame is 6.75" (17cm) high. 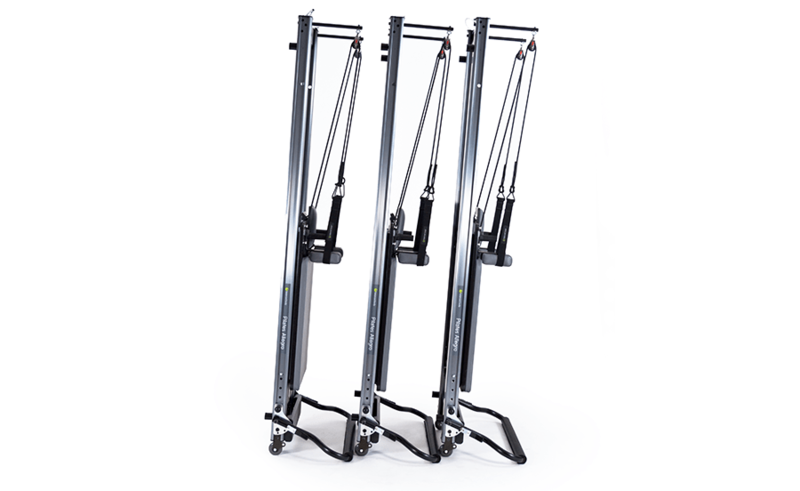 Optional leg kit elevates the frame to a personal training height of 14" (36cm). Footbar: the safest (36"/91cm) footbar available. Standard Allegro footbar has 4 locking vertical adjustments and 4 horizontal. The Stretch Allegro has one additional vertical and horizontal adjustment so that it accommodates average-height users as well as large and tall users. TwistLock™ shoulder rests: allow quick adjustments to 4 positions to accommodate different users, or complete removal if desired. Ergonomic and sculpted for comfort. SoftTouch® rope system: easy to adjust and quiet, with no metal clips. Three-position headrest for comfort and cervical support. Built-in standing platform (with pad) with non-skid finish measures 5" x 22" (13cm x 56cm) on the standard Allegro. The Stretch Allegro includes an oversized standing platform, 8.75" x 22" (22cm x 56cm). Swivel pulleys allow variable angles of resistance. Anodized aluminum finish is sleek and durable. Custom stability padding maximizes comfort. Choose the upholstery color that matches your home or facility. Heavy-duty vinyl in 35 colors. Nine colors are standard/free; 26 additional custom colors are available (extra charges apply). Stock color: Black. Smooth, quiet carriage ride is the result of our 8-wheel suspension system, featuring 4 custom-built vertical wheels to support the carriage, and 4 adjustable sidewheels to guide the carriage smoothly down the track. Package of five springs is included: 1 yellow (very light), 1 blue (light), 3 red (medium). Time-tested for superior performance under strenuous use, patented springs from Balanced Body are the best available for strength, resilience and durability. Nickel-plated carbon steel, designed exclusively for Pilates. Included: Built-in standing platform with non-slip surface for safety. All Allegro Reformers come with a video workout and setup/safety instructions. The Allegro Reformer footbar allows one-step horizontal adjustments with no change in footbar height, a Balanced Body exclusive. Allegro footbars lock securely in place for safety, on both Standard and Stretch versions of the Allegro. These footbars are 36" (91cm) wide with a 30.5" (77cm) padded cover. Perfect for second position and tall users. Four vertical footbar positions increase or decrease the difficulty of the exercise. Four horizontal footbar positions comfortably accommodate people of various heights. For a small person, move the footbar closer to the carriage. For a taller person, or to reduce hip and knee flexion, move the footbar away from the carriage. In combination with the oversized carriage on the Stretch version of the Allegro, this footbar has additional adjustability that allows both taller and shorter users to use the machine comfortably and with ergonomically correct positions. One additional horizontal footbar adjustment (5 total) brings the footbar as close to the shoulder rests as on the standard Allegro. One additional vertical footbar adjustment (5 total) is also available, which brings the footbar closer to the shoulder rests and also provides a higher position. Add a softer jumping surface to your jumpboard in seconds. It’s a reformer & a half-trapeze. Get enhanced functional training with this economical upgrade. A drop-in mat for standard and 14" Allegros. Turns a standard Allegro into a 14" studio-height Allegro. Use spring resistance for pulling rather than pushing. Open up a whole new realm of Reformer workouts. To use with your sitting box. Secures standing Allegros when storing vertically. Retrofits for Allegro Reformers Jumpboards.